Edinburgh Monarchs have been rocked by the news that reserve star Matt Williamson has quit the team. 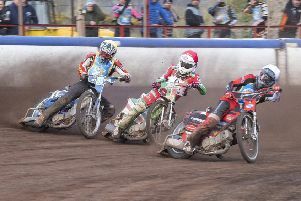 The 25-year-old who was signed from Workington, has decided to take a break from the sport due to stress. Williamson added that machine problems and associated costs have added to his difficulties. ”One of my engines went at Peterborough and then on Lakeside on Saturday. Williamson continued: “I need a break to get happy again. I cannot understand what is happening. I had a good meeting at Glasgow to start with. I scored eight points which continued my form of last season. But since then my highest score has been five which is not good enough. It doesn’t matter how hard I try nothing is going right for me at the moment. “It’s not doing me any good and it’s making me look bad on the track. “It’s not doing the team any good either and I can see the frustration in the team, the management, and the fans. Monarchs team manager Alex Harkess said: “I’m not surprised. Matt has been struggling for a couple of weeks now. He had two engine blow outs at out last two away matches and financially life was difficult for him.